Security and Defence is a topic which only makes it to the front pages of the media when there are actual war operations. Rarely a debate is centered on whether the country needs to foster its capabilities, invest in new defence technologies, or protect a certain industry base. I cannot recall a single electoral programme calling for such initiatives. The defence is not popular in today’s (European) society. Global security – a safe and peaceful environment free of conflict – is a public good. In other words, all of the world’s citizens and countries benefit from it, regardless of whether they contribute to supplying it. Given this, free riders (those who enjoy the benefits of the good without investing in its provision) are likely to be plentiful. But, when it comes to global stability, the world simply cannot afford a free-riding Europe. I truly believe that we should do much more to educate society in the importance of peace, security and defence as goods to be protected and spread, so they can be better valued and supported. “The Time is Now“, by Claude-France Arnould, CEO of the European Defence Agency. “Background Information EU Council“ by the European Defence Agency. “NATO Chief Hopes for New EU Defense Commitment“. “France Looking to Kickstart Debate on Permanent EU Fund for EU Military Operations“. 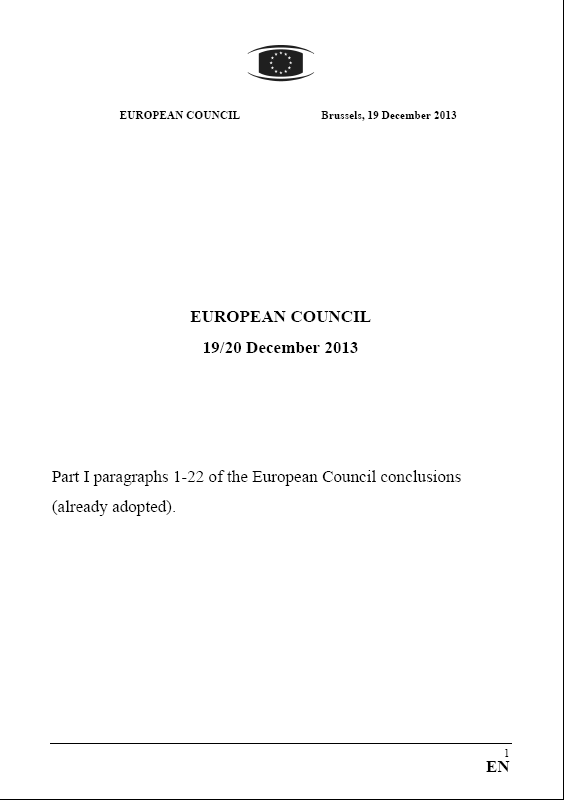 In this post I just want to bring the European Council conclusions [PDF, 118KB] as already published and outline some of the passages. 2. The EU and its Member States must exercise greater responsibilities in response to those challenges if they want to contribute to maintaining peace and security through CSDP […]. The European Council calls on the Member States to deepen defence cooperation by improving the capacity to conduct missions and operations and by making full use of synergies in order to improve the development and availability of the required civilian and military capabilities, supported by a more integrated, sustainable, innovative and competitive European Defence Technological and Industrial Base (EDTIB). This will also bring benefits in terms of growth, jobs and innovation to the broader European industrial sector. 4. […] the European Council has identified a number of priority actions built around three axes: increasing the effectiveness, visibility and impact of CSDP; enhancing the development of capabilities and strengthening Europe’s defence industry. further strengthening cooperation to tackle energy security challenges. 13. The European Council welcomes the existing cooperative models, such as the European Air Transport Command (EATC), and encourages Member States to explore ways to replicate the EATC model in other areas. 17. A well-functioning defence market based on openness, equal treatment and opportunities, and transparency for all European suppliers is crucial. […] with a view to opening up the market for subcontractors from all over Europe, ensuring economies of scale and allowing a better circulation of defence products.